Supported by Adelaide Insurance Services and BMW Motorrad. Recreating the first around the world ride 100 years on. This week sees the culmination of Geoff Hill and Gary Walker’s incredible three-month journey retracing CS Clancy’s historic trip around the world. I was lying on the ground checking the rear tyre pressure of the BMW when Dr G came wandering past. “What you doing?” he said. “Impossible. Horses don’t have pockets,” he said, proving that my Indian tracking skills had some work to do. 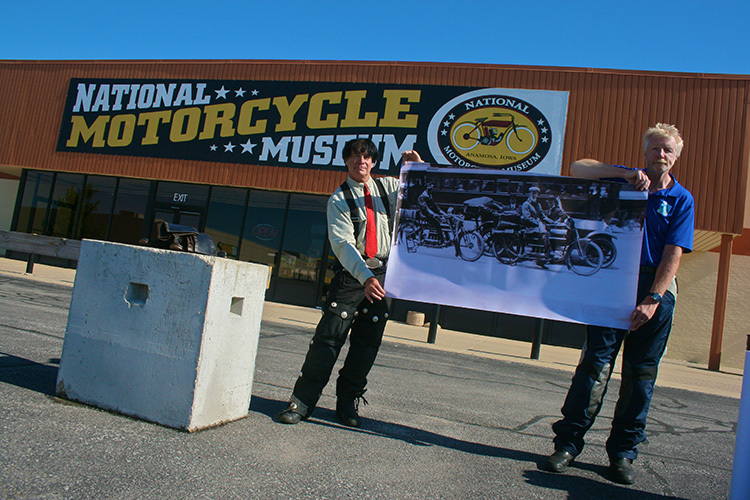 Still, at least we managed to find our way to Anamosa in Iowa, the home of former racer John Parham, who in 1975 with his wife Jill opened a small shop which went on to become J&P Cycles, the USA’s biggest motorcycle parts and accessories mail order business. In 2010, to accommodate his growing collection of motorbikes, he’d bought a disused WalMart down the road and turned it into the National Motorcycle Museum of America. And that, at the end of this trip, would be the last resting place of Clancy’s boots, pith helmet, original diaries and photographs, and Irish and French driving licences. Inside the museum is an astonishing private collection of 400 motorcycles, not to mention a fulsome tribute to the lunacy of Evel Knievel. I defy anyone to watch the videos of him jumping 200ft over a row of buses then trying to land on a Harley with only a few inches of suspension travel and not wince. In the British section are some fine examples of the Rudges my dear old dad raced in the Fifties, the Norton International and Manx Norton he would have raced if he’d had the money, and Brough Superiors and Vincent Black Shadows we’d all own if we had the money. One Brough, the SS100 Pendine, was named after the long, flat beach in South Wales where every model was tested to 110mph before being handed over to customers, and on which George Brough set a world record of 130.6mph in 1928. More within my means was an NSU Quickly which was the first motorbike I ever rode, racing up and down the avenues of Termon in my teens. 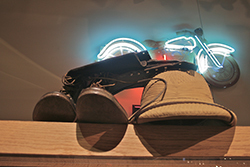 In the US section, there was Peter Fonda’s Captain America chopper and helmet from Easy Rider, and past all the Harleys and Indians, exquisite machines from companies such as Reading-Standard, Racycle, Emblem, Thor, Pierce, Royal Pioneer and Flying Merkel which failed to make it past the Twenties and Thirties. And then, at last, the holy grail: the only original 1912 Henderson in the world. Of the 15 or so Hendersons made that year, John Parham knew of only three in existence today, and the other two had been restored with later parts, making this the only unrestored one, down to the original paint and tyres. And while the Henderson Cork man Paddy Guerin had brought to the Dublin launch of our trip had been a 1922 three-speed model, this was the real deal, with 7hp, one gear, a hand-crank starter and no front brakes. I stood there looking at the motorcycle which would soon be joined by the effects of the man who had ridden one of them around the world a century ago, and as much as I had marvelled at Clancy’s courage in making the journey we had followed, I now marvelled even more to see what he had done it on. To contemplate it was the act of a madman, and to complete it the act of a hero. 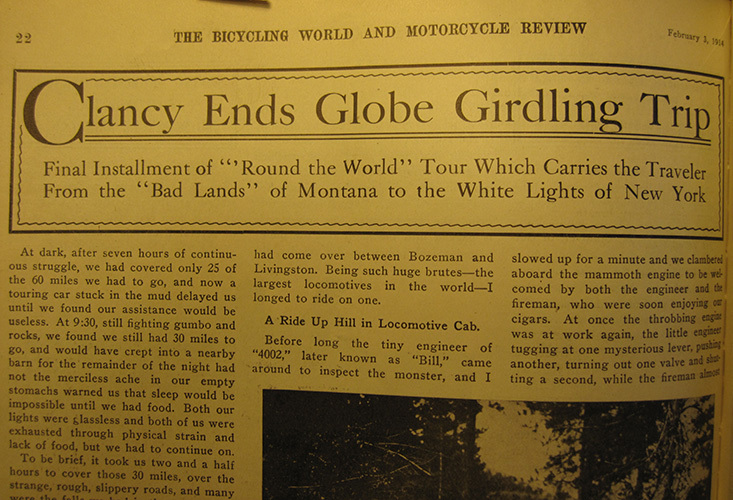 By now, Clancy was on the scent of home: visiting his brother in nearby Beloit, he made the front page lead in the local paper, then was brought down to earth yet again by a crash 20 miles from Chicago which bent his rear wheel. 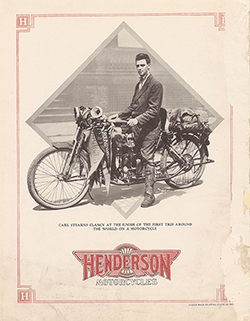 Riding on carefully, he came on two bikers repairing a puncture who regaled him with thrilling tales from their 200-mile adventure, then guided him to the Henderson branch factory on Michigan Avenue. There, he had a hero’s welcome: they placed his battered Henderson in the front window and entertained him royally for two days solid before sending him on his way to the main factory in Detroit, where he was feted even more, while the brand new Hendersons coming off the production line looked at what he fondly imagined was mute admiration of their older and wiser brother. We were now in the last few days of our own grand adventure, and when I looked back through the pages of our daily schedule, it felt like we had gone through an entire lifetime in just three short months, with events like leaving Belfast in the snow, sitting on the boat to Tunisia, riding through Sri Lanka in monsoon rain and marvelling at our first sight of Hong Kong bay or the skyscrapers of Shanghai like something we had done years ago, when we were young. 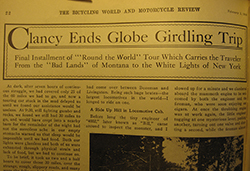 After a brief surprise visit to his delighted parents, Clancy rode into New York State and rolled in splendid happiness along the finest roads of the entire trip, and on the morning of August 27, 1913, a moving picture camera captured his triumphant return into Manhattan at the end of an 11-month, 18,000-mile odyssey which had tested him countless times to the limit and taught him lessons he would learn for the rest of his long life. And now, at last, having carried the boots he wore on that incredible journey on the recreation of that journey a century on, we handed a replica of the Around the World pennant that Clancy had carried to his great-niece Lynda Clancy, then handed the boots over at last to Dr Gregory Frazier with respect and pride at having followed in the tyre tracks of such a fine man. I hoped, as I handed them to Dr G, that they had had the time of their lives for the second time. 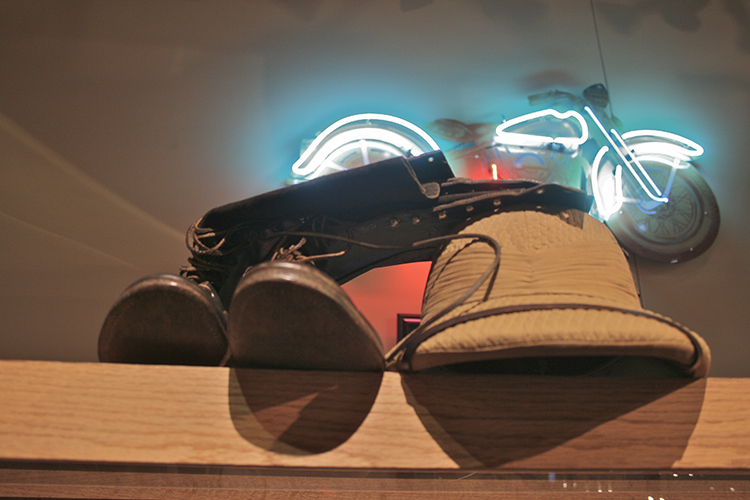 If boots could talk, I think they’d be very pleased indeed, and I hoped that we had made a pair of old boots very happy. Main sponsor, Adelaide Insurance Services are motorcycle insurance specialists operating UK wide and in the Republic of Ireland. In 2012 they were voted the UK’s number one for value-for-money in the Auto Express Driver Power survey beating all the UK’s best known brands. This annual poll had responses from 29 000 readers.